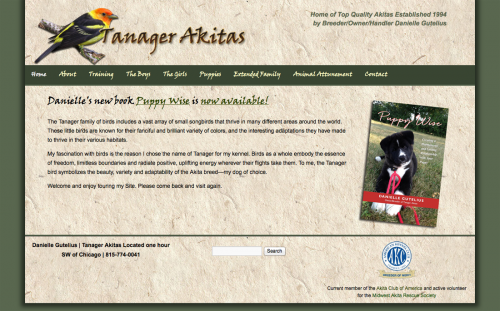 Tanager Akitas is located one-hour southwest of Chicago, amidst the cornfields and pastures of Elwood, Illinois. It became formally established in 1996, although, in my mind it has existed since 1973. At that time, I was eight years old, and knew the Akita was the breed for me. Twenty years later, with never a doubt, my life was forever changed with the arrival of my first Akita. Producing and presenting gorgeous, healthy, sweet-tempered Akitas has become my greatest joy and personal commitment. When considering a breeding at Tanager Akitas, soundness in health and temperament are of utmost importance. I put every effort into producing puppies that are free of genetic defects so that they are able to live a full life without the heartbreak of debilitating health problems. Each dog used in my breeding program must be certified free of hip dysplasia (OFA/PennHip) and eye disease (CERF), and be thyroid normal. All my puppies are raised in my house with love and training to encourage their gentle spirit, setting them on the path of becoming loyal and loving family members.